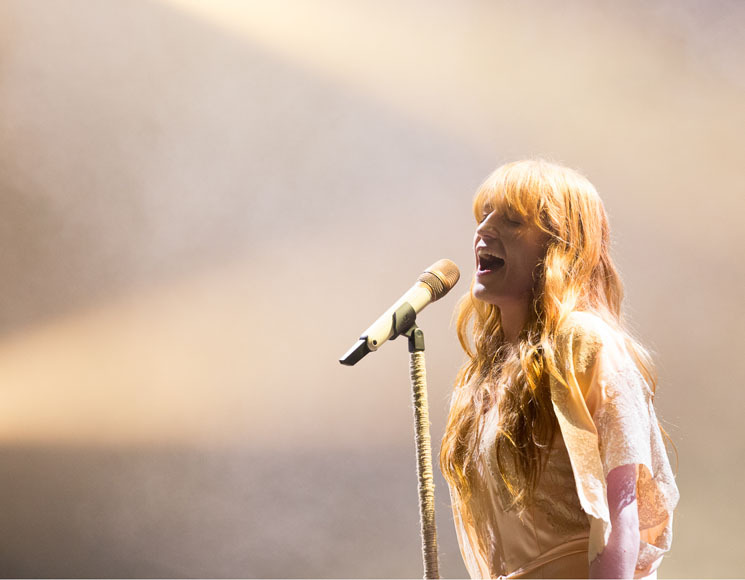 Florence and the Machine headlined Osheaga for the third time. Despite touring in promotion of their new album, High As Hope, there was still a sense of trepidation weighing on the crowd, many of whom who had already seen Florence Welch dance around the stage and belt out "Dog Days Are Over" at (almost) the exact same spot. Would it be a good set or just a vague sense of déjà vu? The minute Florence took to the stage, however, it was clear that something had shifted. This was Florence at her best. For the next hour-and-a-half, Florence and her backing Machine performed one of the best sets of the festival, and erased all doubts from everyone's minds. Wearing a long peach silk dress, Florence threw herself about the stage in both interpretive dance and ballet fashion, being the classic witchy Florence that her fans have grown to know and love. Moving through songs off High As Hope, like "Hunger" and "Patricia," as well as older hits like "Cosmic Love," Florence was woman possessed — each note she belted out carrying over the packed crowd and she vibrated and threw her limbs every which way. Speaking directly to the audience, asking friends to put others on their shoulders so that she could "see everyone's faces," followed shortly by a request during "Dog Days Are Over" that got the entire festival grounds jumping, hands in the air. It was clear that Florence, for a moment, was a shaman. During "Delilah" she ran down the audience barefoot to crowd-walk across the slew of people, all begging to touch her feet, as she belted out "It's a different kind of danger / and the bells are ringing out," never missing a note. Ending with a small encore, Florence and the Machine had clearly converted the sceptics in the audience and had also accumulated hundreds — if not thousands — of new fans.